UPDATE (12/8/12): This giveaway is now CLOSED. The winner (chosen by random.org) is comment number 18, Julie @ Sugarfoot Eats! Congrats Julie! Please email me at kitchenconcoctions at gmail dot com to claim your prize. Thank you to all those who entered! NOTE: Winner must contact Kitchen Concoctions within 72 hours at kitchenconcoctions at gmail dot com to claim prize. If winner has not claimed prize within 72 hours then a new winner will be notified. Kitchen Concoctions is not responsible for unclaimed, undelivered or damaged prizes. I’ve partnered up with Hodgson Mill again to bring you another great giveaway! But instead of talking pizza like we did before, today we are talking holiday baking! Hodgson Mill challenged me to create a sweet or savory holiday baked good using one of their specialty flours as part of their “Have a GRAIN Holiday” campaign. So I created a warm and comforting cookie recipe that I will be sharing with you all later today (do be sure and check back this is one you don’t want to miss!). To help you “Have a GRAIN Holiday” Hodgson Mill wants to give one lucky Kitchen Concoctions reader a Hodgson Mill Holiday Baking Prize Pack, with $25 worth of Hodgson Mill products. Continue reading below to see how you can enter the giveaway here on Kitchen Concoctions. But the good news is, if you want a second opportunity to win a Hodgson Mill Baker’s Holiday Gift Pack click here and head over to the Hodgson Mill website to enter again. 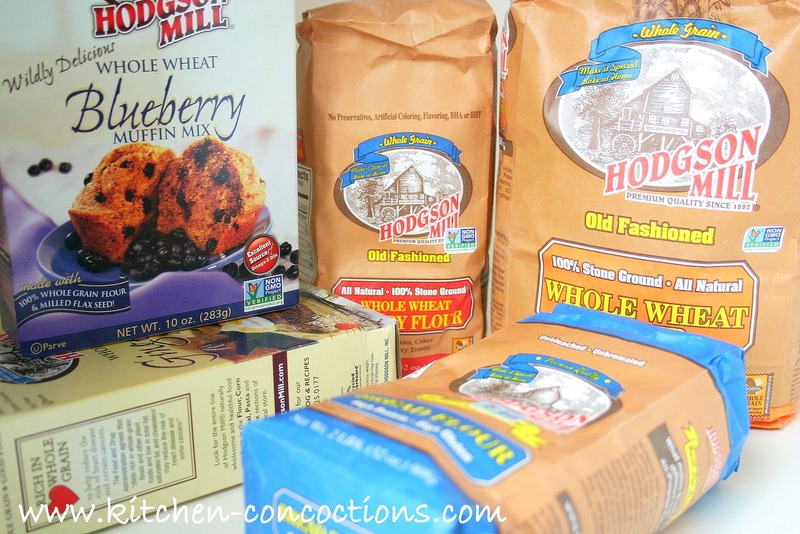 You can also click here to print a $1.00 off coupon for any Hodgson Mill flour or cornmeal. One lucky Kitchen Concoctions reader has the chance to win a Hodgson Mill Holiday Baking Prize Pack, valued at $25 (contents of prize pack may vary slightly). 1. Leave a comment stating your favorite holiday baked good. 4. “Like” Kitchen Concoctions on Facebook. 5. Follow Kitchen Concoctions on Twitter. 6. Follow Kitchen Concoctions on Pinterest. 7. Follow Kitchen Concoctions on Instagram @kitchenconcoctions. This give-away closes Tuesday, December 4, 2012 at 11:59 PM CST. Winner will be chosen at random (by random.org) and will be announced sometime shortly after the give-away ends. Winner must contact Kitchen Concoctions within 72 hours at kitchenconcoctions at gmail dot com to claim prize. If winner has not claimed prize within 72 hours then a new winner will be notified. Kitchen Concoctions is not responsible for unclaimed prizes and will choose another winner if original winner has not claimed prize within 72 hours of being announced. Giveaway for US residents only. Kitchen Concoctions is not responsible for undelivered or damaged prizes. Contents of prize pack may vary slightly. NOTE: Please check back shortly after giveaway closing to see if you are a winner. As much as I would like to run all over the Internet world looking for you, I do not have the time. So you as the winner MUST contact me with your information. My fave Xmas treat is banana bread! follower of Kitchen Concoctions through Google Friend Connect. “Like” Kitchen Concoctions on Facebook. follow Kitchen Concoctions on Twitter.
. Follow Kitchen Concoctions on Pinterest. Hands down my mom's sugar cookies! Seven layer cookies are my favorite! I like Kitchen Concoctions on facebook. Cinnamon rolls are my favorite! Lots of favorites, but thumbprint cookies are the best! My fave is a classic peanut butter blossom. My favorite holiday bake goods peppermint sugar cookies. I liked Kitchen Concoctions on Facebook. I love to make banana bread this time of the year. Any chocolate treat is my weakness. My favorite holiday baked good is extra creamy peanut butter cookies. I like Italian Wedding Cookies during the holidays. I follow Kitchen Concoctions through Google. I am a Kitchen Concoctions Facebook Fan. My favorite is Chocolate Peanut Butter Pie.